The Continuum will be visiting the set of The Punisher on Sunday in Tampa, Fla.
Look for reports on the film, including an interview with star Thomas Jane, throughout the week starting on Monday. Dreamwave and Hasbro Consumer Products Worldwide have announced a January launch for the new ongoing series Transformers: Generation One. The first issue will ship following a prquel #0 issue in December. 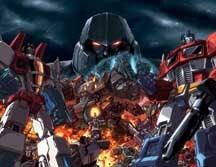 "The Transformers: Generation One will start with Starscream and his band of rogue Decepticon robots as they make their way towards Earth. Meanwhile, with Optimus Prime and Megatron being reconstructed, Prowl struggles to hold things together as Cubertronteeters on the brink of destruction. All that and ... the debut of a brand-new Generation One character. Writer Brad Mick has fired up this seat-throttling adventure and with one of Transformers fans' favorite artists Don Figueroa penciling the meanest bots ever." "This is the one I've been waiting for since I was a little kid," Mick said. "So, expect the intensity level to crank up to about 11 here with even more characters, more drama and of course more big, bad robot action than before. With Don Figueroa and Espen Grundetjern on board this will be the greatest looking Transformers comics since Transformers: The Movie!" There will be three Figueroa covers including one single, one wrap-around and a limited Dynamic Forces cover. Dreamwave president Pat Lee will also create an incentive cover which will feature a new, never-been-seen-before character. Click on the thumbnails above for larger views. For covers and four- and five-page previews of upcoming titles, CLICK HERE. Titles include Sigil #40, Noble Causes: Distant Relatives #3, Wolverine: The End #1 and Superman: Kansas Sighting #1. Due to what it calls "the continuing overwhelming response to its Epic Comics open submissions call," Marvel Comics announced Friday it is temporarily suspending acceptance of any new Epic submissions. The announcement came on the same day of several unsourced reports that Bill Jemas, who relaunched Epic and was an active proponent of the initiative, would be leaving Marvel within the next few months. The company has not commented on Jemas' future. "The response has simply been incredible, and because of the high volume of pitches we're still receiving, we're no longer going to be able to evaluate them and respond to aspiring creators in a fair and reasonable time frame," said Epic editor Teresa Focarile. "Creators who have taken the time and energy to go through the submission process are entitled to a timely response. "Now that we realize the level of response and the kind of commitment these projects require, we are going to restructure the Epic process across all editorial offices and implement some new procedures that will hopefully have us back on track before too long." "Meanwhile, the early results have been extremely positive, and we've already found new talent whose Epic projects fans will not only see in 2004, but who are also working on and pitching for projects within the regular Marvel editorial offices, like John Jackson Miller, writer of his own Epic series Crimson Dynamo and premiering this month as the new regular Iron Man writer." According to Marvel, it is still looking for new writers on an ongoing basis, and the standard submission options are still in place. Details can be found at the company's web site. According to the publisher, writers found though this process might also be showcased in two new, ongoing bimonthly titles premiering in early 2004 - Spider-Man Unlimited and X-Men Unlimited. Each title will feature two stories debuting new writers teamed with established artists . "We're still seeking and developing new talent and have created showcases just for these new writers, and just for the time being we're scaling down the Epic process to give aspiring creators the attention and professional response they merit," Focarile said. After a brief stab at self-publishing, Chris Eliopoulos is returning to Image Comics, and an all-new Desperate Times series will debut in January. "I took a break from Desperate Times to concentrate on doing cartoons for the Complete Idiots Guide books when Marvel Comics showed an interest in the comic and signed me up to do a new series," Eliopoulos said. "Because of a policy change, though, the deal fell through, but I found myself getting demands for more of the DT gang from all ports. So, I decided to go home. I missed writing and drawing these characters and spinning the events from my life out onto paper in weird, odd ways." "Desperate Times plays fly on the wall to the lives of two lovable losers: Marty (the cynical realist) and Toad (the geek) as they grapple with their lot as single guys in a coupled world. Coping isn't always easy, though, especially when they're surrounded by an oddball cast of characters that make the series' hapless stars seem like prime marriage material. Which is oddly fitting as Marty and Toad deal with a life change in the new series: one of them gets married. Joined by Marty's self-centered sister, Linda, Doofus (who never gets out of his theme park costume) and Kennedy, the drunken three-toed sloth, as well as characters both new and old, they're now trying to make it through life without killing each other. In essence, Desperate Times is comic strip just like the ones in newspapers, only funny. Appealing to women as much as men, it's frequently described as Seinfeld in comic strip form." Eliopoulos released a four-issue Desperate Times mini-series through Image in 1998, followed by a trade paperback collection in 1999. Following that, Eliopoulos launched his own ARRRGH! Comics in 2000 and produced four issues of Desperate Times on his own before turning his attention to illustration work and the lettering on Marvel's Ultimate line. 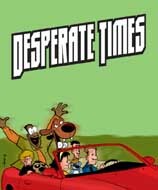 Desperate Times #0 will be in stoers on Jan. 14. "Hell Bound," a new episode of Angel, is scheduled to air on The WB on Wednesday, Oct. 22. "Spike (James Marsters) struggles to maintain his weak grip on reality as spectral forces threaten to send him to hell. He encounters ghostly apparitions, including an eighteenth-century serial-killer doctor. Meanwhile, Fred (Amy Acker) continues her quest to find a way of restoring Spike to his corporeal self." Coming Monday: Movie news -- and much more!!! 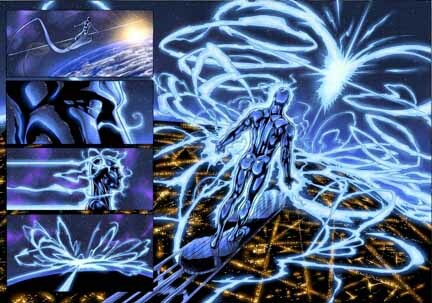 * For Saturday, Oct. 4, including Silver Surfer news, CLICK HERE. * For Friday, Oct. 3, including Smallville news, CLICK HERE. * For Thursday, Oct. 2, including Spider-Man news, CLICK HERE. * For Wednesday, Oct. 1, including Jutice League news, CLICK HERE. * For Tuesday, Sept. 30, including Jutice League news, CLICK HERE. * For Monday, Sept. 29, including Catwoman movie news, CLICK HERE. * For Saturday, Sept. 27, including Batman news, CLICK HERE. * For Friday, Sept. 26, including Smallville news, CLICK HERE. * For Thursday, Sept. 25, including Smallville news, CLICK HERE. * For Wednesday, Sept. 24, including X-Men: Evolution news, CLICK HERE. * For Tuesday, Sept. 23, including Angel news and images, CLICK HERE. * For Monday, Sept. 22, including Marvel's solicitations for December, CLICK HERE. * For Saturday, Sept. 20, including Smallville news, CLICK HERE. * For Friday, Sept. 19, including details on the Mutant X season premiere, CLICK HERE. * For Thursday, Sept. 18, including CrossGen news, CLICK HERE. * For Wednesday, Sept. 17, including Image Comics' solicitations for December, CLICK HERE. * For Tuesday, Sept. 16, including DC Comics' solicitations for December, CLICK HERE. * For Monday, Sept. 15, including an Underworld interview, CLICK HERE. * For Saturday, Sept. 13, including Platinum Studios' deal with Disney, CLICK HERE. * For Friday, Sept. 12, including Dark Horse's solicitations for December, CLICK HERE. * For Thursday, Sept. 11, including Smallville news, CLICK HERE. * For Wednesday, Sept. 10, including Marvel news, CLICK HERE. * For Tuesday, Sept. 9, including X-Men: Evolution news, CLICK HERE. * For Monday, Sept. 8, including Marvel news, CLICK HERE. * For Saturday, Sept. 6, including Sharon Stone talking about Catwoman, CLICK HERE. * For Friday, Sept. 5, including Spider-Man/MTV news, CLICK HERE. * For Thursday, Sept. 4, including X-Men: Evolution news, CLICK HERE.